Aren’t elimination races exciting? You get to watch four teams who’ve worked their butts off get disappointed by other teams being better than them. Sorry. Maybe I’m sick. Still, elimination races are fun for those of us in the safety of not working on a team competing for the championship — and fun is just what Kansas was. In the competitive age of racing, it’s uncommon to see new teams join the ranks of the Monster Energy NASCAR Cup Series mid-season. However, that’s what StarCom Racing did, making their debut at Kansas with driver Derrike Cope. The car number — the double-zero — contains a zero for each of Cope’s NASCAR wins so far in his career. Unfortunately for the team, the No. 00 suffered engine issues early and finished in last place. Not the start the StarCom gang had hoped for, I assume, but it says something to acquire a car and equipment, take it to the track, qualify for a race, and compete in the event. At least they can claim they qualified better than Playoffs contender Ryan Blaney. Thumbs up to new competitors. 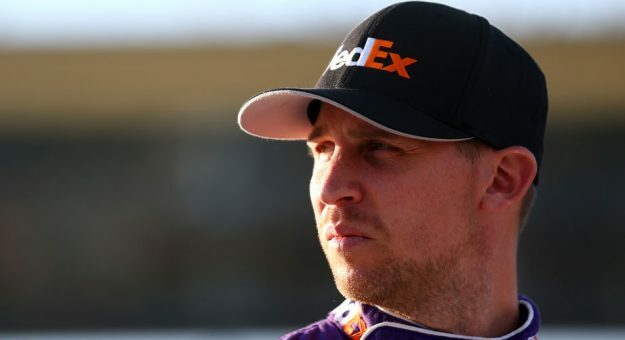 The highlight of Denny Hamlin’s race Sunday might have been when he won Stage 2 by staying out on old tires and holding off the field in a one-lap dash — something that happened by luck. While Hamlin was making a routine pit stop during Stage 2, he was set to take off and resume the race once the jack dropped (as is normal procedure), when he suddenly heard his crew chief, shout, “Hold up!” Hamlin, well, held up, losing valuable time and track position. It turns out “Wheels” was saying “hard out, hard out” to his driver — a directive to exit the pits aggressively (not stop). Thumbs down for language that could get misinterpreted over team radio. And why does a crew chief need to tell a driver when to drive fast? That’s literally the driver’s job. 1.5-mile tracks are the most competitive tracks on the circuit. Since there are 11 races at tracks 1.5 miles in length on the 36-race circuit, each team seems to tune their programs specifically toward tracks the size and configuration of Kansas Speedway. That makes it all the more impressive when an organization that’s generally considered an underdog has a solid run — exactly what Chris Buescher and his JTG Daugherty Racing team did by finishing sixth. Buescher even earned a shout-out from Dale Earnhardt Jr. in his post-race Periscope race-recap (that’s a tongue-twister). Thumbs up for having a good run at a track where the cream tends to rise. By all accounts, Kyle Larson, Matt Kenseth, Jamie McMurray, and Ricky Stenhouse Jr. had solid seasons. But each of those solid seasons came to a grinding halt Sunday when the vicious, vicious Round of 12 struck. Larson, considered by many a lock for the Championship 4, experienced his first engine failure as a full-time driver at the worst possible time. Kenseth, in what may be his final season in a championship-caliber ride, learned the hard way about violating crash clock rules. McMurray, the guy at the office who seems to perform just well enough to keep his job during his annual review, got collected in the “Big One” (and, no, not just at Talladega, where he was also swept up in a multi-car crash). Stenhouse, after winning the first two races of his career and surviving the opening Round of 16, pummeled the wall and ruined his day, pinning him outside the top eight. For these four drivers who posted four solid campaigns, their bad luck happened at the worst possible time — an elimination race. Thumbs down for poor timing of bad luck that ruins championships. Championship contender Ryan Blaney was tasked with a big mission after failing post-qualifying inspection: start in last place (even behind the StarCom Racing No. 00) and make his way through the field, hopefully solidifying his odds of making the Round of 8 and surviving the elimination. Blaney did just that, finishing third at Kansas … but would it have happened that way if Blaney hadn’t started in the last spot on the grid? Normally, in NASCAR most of those asking “What if?” are those who had a bad day. But the big “What if?” here is an interesting thought. If Blaney had started the race up front (he’d qualified third before failing inspection), would he have been caught up in the Lap 199 crash that finished off Kenseth and McMurray? We’ll find out for sure if some more teams start suspiciously tanking inspection to get some of that luck o’ the Blaney. Or kiss the Blaney Stone. Whatever. Blaney and the Wood Brothers now will move to the Round of 8, and inch closer to a title. Thumbs up for finding the positives and making the best out of what could have been a disastrous situation.